From the above quoted verse, KJV and ASV classifies the ministers of the new covenant or new testament into two; 1) ministers of the letter and 2) ministers of the spirit. It further gives the characteristic of these ministers into either; 1) death causing or 2) life giving, more specifically, describing the letter as the one that kills and the spirit that gives life. 6 who has also qualified us to be ministers of a new covenant, which is not written but spiritual, because the written text[b] brings death, but the Spirit gives life. By implication, when using the ISV and superficial analysis, the born-again Christians and the like, who are basing their doctrines on the text or bible could be considered as the ‘ministers’ of the written text that brings death, which is not acceptable to many Christians. Superficially also, the Roman Catholics would have an advantaged position because they may be considered as ministers of the spirit, as they are not strictly basing their doctrines from the text or bible. But, considering the weakness of ISV translation, when it classifies the ministers of a new covenant into 1) not written and 2) but spiritual, which do not make sense, at all, it’s no longer tenable to follow the logic of Roman Catholics traditional belief of not strictly sticking to the letter or bible to be the work of the minister of spirit. Also, based on the same ground, ISV translation can be considered as substantially defective. However, its translation on “written text that brings death” may be found correct, without adversely affecting the validity or correctness of the “letter that kills” of KJV and ASV translations. In fact, both can be accepted as significantly the same, despite the general notion that ‘letter’ refers to the letter in the alphabet but the written text refers to the bible, document, report or book, which can make you conclude otherwise. “6He is the one who has helped us tell others about his new agreement to save them. We do not tell them that they must obey every law of God or die; but we tell them there is life for them from the Holy Spirit. The old way, trying to be saved by keeping the Ten Commandments, ends in death; in the new way, the Holy Spirit gives them life”. Hence, TLB , by consensus, fatally failed for the second time, in terms of translation of the verse. Letter versus written text: Is there any difference? The proposition is: ‘There is no significant difference between the letter and the written text in 2 Corinthians 3:6, as cited in KJV/ASV and ISV, respectively’. Above can be proven, if you use historical evidence or related circumstance, which can reconcile the seeming difference between the meaning of the ‘letter’ and the ‘written text’. 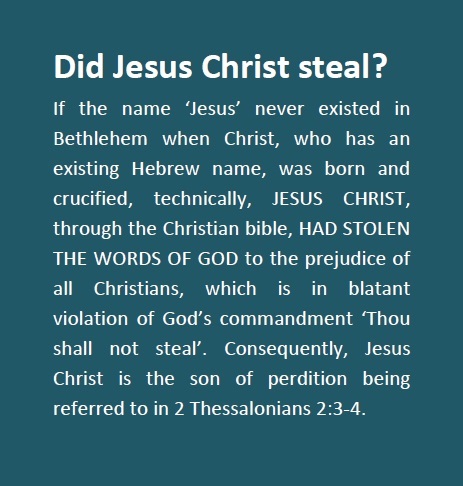 More specifically, if you consider the evolution of the name Jesus, which is being falsely revered as Christ and God by Christians. In short, the letter ‘J’, which can be used as a barometer to identify this biblical ‘letter that kills’, was instrumental in the development of the name ‘Jesus‘ in Jesus Christ. In fact, it is the only name that has this peculiar historical character and background. That being so, the name, including, consequently, the Christian bible, can be cumulatively denominated as “the written text that brings death“, as a whole. In short, the letter J, which is, by history, connected to the name Jesus, is actually the ‘literal’ letter that kills. This is so because said letter was instrumental in the evolution of fictitious name Jesus that converted the truth in the bible into lie. Also, previously, the Christians bible was, consequently, figuratively denominated as “the letter that kills”. as a whole, following the logic based on KJV and ASV translations. The is so because letter ‘J’ in Jesus and consequently, Jesus Christ per se and the bible itself are intimately connected to each other. In fact, technically, one does not exist in the absence of the other. Hence, the ‘written text that bring deaths’ in ISV translation is still correct being the literal equivalence of the bible, as the ‘written text that kills’, when it converted the bible into lie by using a fictitious name Jesus, as Christ. In conclusion therefore, the written text that brings death is significantly the same to the letter that kills because the falsity of the name Jesus, which never existed in Bethlehem, when Christ, who has an existing Hebrew name, was born and until he was crucified, adversely affected the written text or bible, which, consequently, brings death, more specifically, the death of the truth. By aaphil in Religious Deception, The Word on February 9, 2015 .